While he's probably better known in these United States for his work on the hilarious Last Kiss series, which uses the Romance genre to parody everything from comic collectors' strange obsessions to the alleged criminal activities of certain purveyors of good taste, John Lustig would arguably be more recognized overseas for his various contributions to the Disney mythos over the years. Which might seem odd until you consider the simple fact that the main body of his Disney-related work hasn't been seen in America, or even English, for quite some time now. However, the release of the first few issues of the new Gladstone line of Disney books has already begun to change that. Another important change, and one which is sure to lift the spirits of Duck fans the world over, concerns his plans to increase his production of Duck tales in the future. But we're beginning to get ahead of ourselves, and should let John tell us about his plans in his own way. Bill Baker: John, you've written for a number of different companies, but I was especially curious about the circumstances that lead to your working on the Disney characters? While I was at college, I found out that Gold Key comics was open to stories. This is going back to before I even started writing for Disney. I submitted some Donald Duck and Uncle Scrooge plots, which they didn't need, because they had somebody else writing those books. So I ended up writing a Daffy Duck story. And then I got on with my journalism degree, and didn't come back to comics for about ten years. 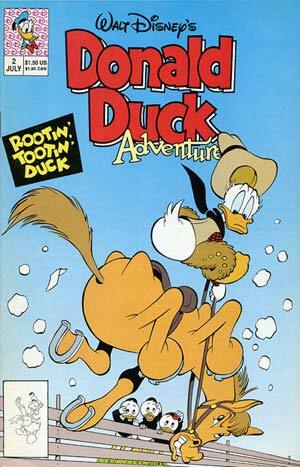 But, as somebody who wanted to write comics, I wanted to write Disney comics. And, it'd be about 1986, I was at the San Diego Comic Book Convention -- this would be during the heyday of the Teenage Mutant Ninja Turtles and all the rip off versions of that that people were doing -- and there was one little publisher called Blackthorne which was doing their own rip offs of the Teenage Mutant Ninja Turtles, and I was talking to them at their booth. And the state of comic books at that point was so low that the fact that I had a journalism degree impressed them -- just because I could spell, I think! [General laughter] Anyway, and they said, "How'd you like to write something like this?" and pointed to their latest take off on the Teenage Mutant Ninja Turtles. I wasn't too enthused about that, even though I desperately wanted to get back into the business. 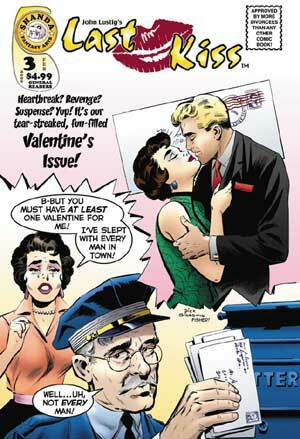 But I spotted a comic called Nervous Rex by William Van Horn, and I'd read one issue of that and really had liked it. So I said, "Well, I could do that, but I'd really like to do something like this." And their editor, said, "Oh, well, actually, Van Horn is open to plot submissions. So give us some stuff, and we'll pass it on to him." I did, and Bill Van Horn apparently liked a couple of the story ideas and decided to use them in issue #10. Which turned out to be his last issue, so I killed off his comic book. [General laughter] But since I'm in Seattle, and Bill's in north Vancouver, I went to visit him while we were on vacation once, and we got to be good friends. Our wives, who are both nurses, really hit it off, as well. Anyway, about a year later Bill was doing stories for Disney, and he invited me to write some scripts for him. So I started doing one and two page stories, and I submitted them to Bill. Bill made some minor modifications, drew them up and sent them to Gladstone -- which was the Disney publisher at the time. And so I was suddenly a Disney writer without ever talking to the editor. It wasn't until the next year, I think, that I actually was in contact with the editor. So I kind of came in through the back door. 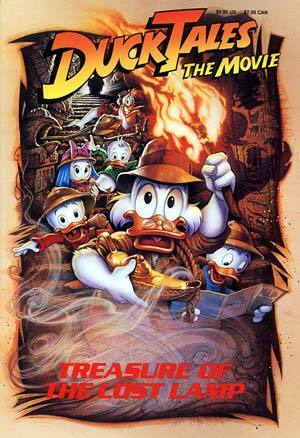 And then I did a few Duck Tales, and a long Donald Duck story. 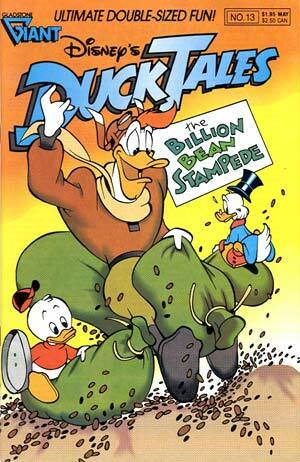 Disney didn't know how to approach their own comic books, oddly enough. They were trying to do very upscale stuff, and they were doing adaptations of their TV cartoons and so forth. And it was pretty clear that they just didn't know what they were doing. Well, lo and behold, after about four years, I guess, they decided to give up and give the license back to Gladstone. By that time both Van Horn and I were working directly for Egmont, then called Guttenberg, and our editor there was the same editor who'd been at Gladstone, Byron Erickson. He'd moved to Denmark. By the way, to explain the situation with Egmont [for those who are unfamiliar with it]: Egmont is a packager that puts together Disney comics for most of Europe and a good part of the world. And Disney comics really sell over there. There are both weekly comics and monthly comics, and the monthly ones are these thick pocket books. If you put a few of the countries together, they sell in the millions. There's nothing to compare here in the United States, in terms of sales for comic books, to what the Disney comics sell in Europe. It's just absolutely phenomenal. BB: Right. About the closest comparison would be comic sales during the heyday of our Golden Age, when everyone bought and read comics off the newsstands here. Numbers that current publishers would love to have, essentially. JL: Oh yeah, absolutely. Although they have gone down some in the last few of years. Part of it is probably due to TV, video games and everything that's impacted the numbers over here. I don't remember the sales figures, but they're still quite huge. In Finland, I think one in four people reads Disney comics, or something like that. BB: And we're talking about regular readers there, not the occasional reader. JL: That's a regular reader. 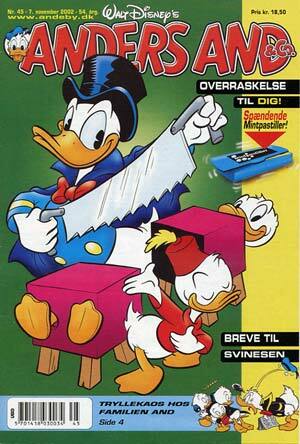 So they aren't just picking up the "Giant Death issue of Donald Duck". [General laughter] So it's the exact reverse over there of what it is here. Over there, Disney is very big, and non-superheroes are very big, and the superheroes are relatively a small phenomenon. Here, of course, it's exactly the reverse. BB: Well, what about these feathered and furred characters interests you so much, that opens up all these different story possibilities? JL: The short answer would be "Carl Barks." 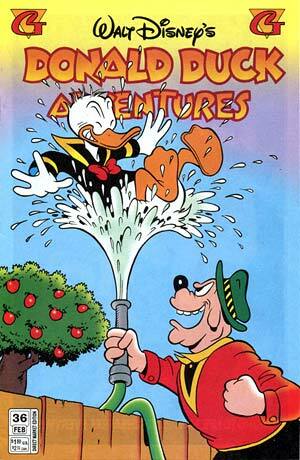 [Laughter] And, to some extent, Floyd Gottfredson. Carl, of course, did the Ducks, and Floyd did the Mickey Mouse comic strip for years [1930-75, ed. ], although he did have some help from writers with that. I think the first thing to say to people is that the characters they know from cartoons and so forth, other than the fact that they look similar, there is very little similarity between them and the comic book characters. Or at least when the comic book characters are done properly. I don't know how much the readers will know about this, but Carl Barks started doing the first comic book versions of Donald Duck. He later created Uncle Scrooge, and he populated Ducksburg with characters such as Gyro Gearloose, and Gladstone Gander, and Magica DeSpell, and the Beagle Boys, and so forth. He created an entire universe, really. The thing about the Ducks, particularly Donald, is that they're such multifaceted characters. In the cartoons, he's just this semi-incoherent, angry and ineffectual bumbling duck who just spends his time squawking and jumping up and down. That wouldn't work in the comics. So Donald had to be able to talk in a way that people could understand him. But that's not a big stretch. He managed to do something that you see in the best children's books; he was able to write stories that both kids and adults could appreciate. He never wrote down to people. He did stories that pleased himself, and his standards were very high. And I think it's one of those things where you can read it at one level [as a child], and then you can appreciate it as an adult, almost at a different level. It's not like there's all these hidden meanings, but there are these subtleties to the emotions that you just don't see in most children's comics. The emotions ring true. Flipping over to the Mouse side, Floyd Gottfredson did tremendous adventure stories where Mickey is a real adventurer, a real go-getter. He's Errol Flynn. He's an action hero, as opposed to, again, the cartoon version -- especially of the fifties and onwards -- where he was this Joe Average, waters his garden, trying-to-get-out-the-front-door-without-falling-all-over-his-face sort of character. And they're much more exciting characters than most people realize, especially if they haven't read the comics. So that's my take on it. And, getting back to Barks for a moment, Carl did two sorts of things. He would do these great ten page stories every month which were very diverse in theme, and gags, and so forth. But he also did these tremendous adventure stories, which is the thing that most people remember from their childhood, if they grew up on these things. Where Scrooge would go off and try to find some lost treasure, and so forth. There's just a whole lot of reasons why I love the Bark's stories. BB: With Gemstone picking up the American Disney license, is there any chance we'll be seeing more of your work, both old and new? JL: Oh, absolutely. Again, though, I have to slip in mention of my other work, Last Kiss. My Last Kiss work has taken up a lot of my time the last few years while I've been learning the technical ropes of what I've been doing with that series. As a result, my production [of Disney work] has not been that great, so there's really just handfuls of stories previously published over there -- maybe like twenty stories or something. But I actually met with my Disney editors at [Comic Con International --] San Diego this year, and they sat me down at a table and basically demanded that I start writing more stories for them. Which is very flattering, and I've agreed to really step up production. 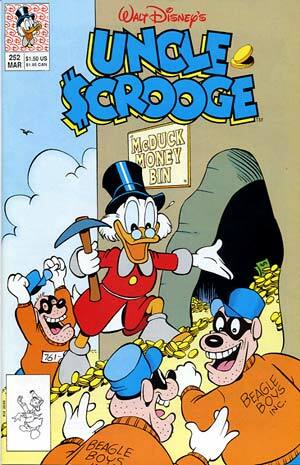 The first issue of Uncle Scrooge that Gemstone has come out with has a story of mine. It's an Uncle Scrooge story, and a golf story, of all things, where he's battling Flintheart Glomgold on the golf course for a treasure. Which made sense, because they're both Scottish. There's an issue of Walt Disney's Comics coming up, issue # 638, that has a story I'm particularly proud of called "Can You Imagine ... Melvin". This sounds really odd, but Egmont asked me to do experimental Duck stories. Stuff that would be way outside of the norm of Disney, either in terms of approach or content. And, frankly, it was really hard to come up with stories that I thought really broke the mold. [Laughter] "Can You Imagine ... Melvin" was the first, and it's hard to describe. It involves magic, and imagination, and the ability to draw anything and have it come true, but still look like a drawing. I won't explain it all, but the boys draw some characters that come to life, but they're all in black and white, and look like kids' drawings. And Donald, meanwhile, is trying to come up with something to show the kids that he's got some imagination. So he draws this two headed dragon robot. Now, none of them know that this stuff is going to come to life, and ... Well, let's just say that the dragon wreaks havoc, and there's some things that happen in the story that you just don't see in a Disney comic: flames going though characters' bodies, for one thing. [Laughter] I don't want to talk about it too much, but it's an unusual story, both in terms of look and in terms of content, and I'll be interested to see what the reaction will be. Although the pay is great, writing stories for Egmont and knowing that they were not going to appear in English anywhere in the world [was a little frustrating]. Because they don't have the Disney comics in England anymore, and I don't think they have them in Australia. The only place they had Disney comics in English in recent years was India of all places, and they would just put them out occasionally. So it's exciting to have Disney back in English, over here. And I think it's important to have Disney back, too, for a lot of reasons. John and his family recently lost their wonderful daughter, Laura. Although she was but ten years old, she had quite an impact on not just her family, but the entire community around her. With that in mind, we'd like to urge you to consider supporting the charity that's been started in her name. Contributions in Laura Lustig's memory can be made to either Wedgwood School ( 2720 N.E. 85th St., Seattle, WA 98115); or to Boyer Children's Clinic (1850 Boyer E., Seattle, WA 98112.) Please include a note saying the check is in Laura's memory so that the money will go to the proper account.